Creative Nation ★ Recruiting The Kabalyero Show - KABALYERO - PLAY, BLOG & EARN! 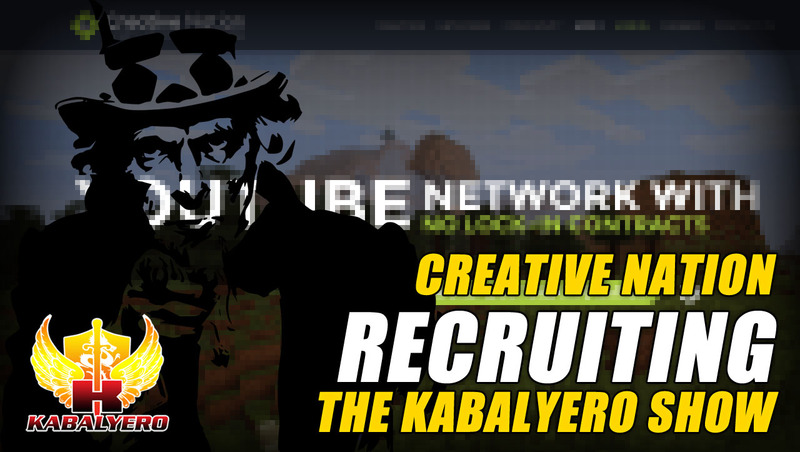 A Creative Nation Talent Scout sent a recruitment message to The Kabalyero Show. Wow! It feels so nice to be wanted! While I was going through my SPAM box, I came upon a recruitment message from a Creative Nation Talent Scout. Based from the recruitment message, Creative Nation is a YouTube Multi-Channel Network like Freedom! Network. I believe the message was a standard copy-and-pasted recruitment message because it was somewhat similar to the ones I've received before from other YouTube Multi-Channel Networks. ► If you have a YouTube Channel and you want to become a YouTube Partner and make a few cents from it then try joining Freedom! Network. The requirements to join are very easy and it's great for smaller YouTube Channels. Join Freedom! Network here → (http://bit.ly/1HWq0ix). I'm not going to go through the entire message in this video but there were two things in the message that somewhat captured my interest. The first one was the 90% revenue share and the second was the part about Content Protection. Currently, I'm getting a 70% revenue share from Freedom! Network so the 90% revenue share offered by Creative Nation was kinda interesting. Also, I've had my videos uploaded by other YouTube users and that's why the part about Content Protection was kinda interesting as well. The rest of the recruitment message was kinda standard and the information on the website of Creative Nation was kinda standard as well. Yes, the 90% revenue share and Content Protection was kinda tempting but I'm more interested in growing my channel. Unless I was offered something specific that will greatly boost my channel's growth like promoting or featuring my channel on all their social media accounts (twitter, facebook, youtube, instagram and others) then I think I'm going to stay with Freedom! Network. So guys, if any of you have any great, good or bad experience with Creative Nation then please post them or share them in the comments section below.